The University of New Brunswick Fredericton’s faculty of business administration celebrated the achievements and contributions of it students, faculty and alumni at its 25th annual business awards dinner recently. 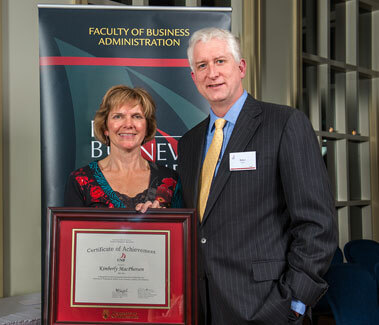 Robert Austin, the dean of the faculty of business administration, presented a certificate of achievement to bachelor of business administration graduate Kim MacPherson (BBA ’84). Shelley Pelkey (BBA ’88) accepted a certificate of appreciation on behalf of CMA New Brunswick. Ms. MacPherson is the auditor general of New Brunswick, responsible for leading and directing independent audits and advising on how well the government is managing its responsibilities and resources. She graduated from UNB's BBA program in 1988 and then obtained the chartered accountant designation. With 27 years of experience with the New Brunswick government, she has served in various capacities as provincial comptroller, in the Department of Finance, the NB extra-mural hospital, the Office of the Comptroller, the Office of the Auditor General, and Thorne Riddell Chartered Accountants. CMA New Brunswick is a self-regulating body that grants a professional designation in strategic management accounting and regulates its members under the authorization of provincial legislation. In 2011, CMA New Brunswick accredited UNB Fredericton’s BBA honours accounting program, which allows students in the CMA stream to fast-track into the CMA strategic leadership program. Two annual CMA stream scholarships worth $3,000 each were recently established and were awarded for the first time this year. Business students on the dean's list, as well as those who received scholarships and bursaries, were recognized for their achievements during an awards ceremony. The value of the scholarships and prizes this year was $415,937.00. Dean Austin also announced the recipients of two faculty research awards. Dr. Rebecca Angeles, a professor of management information systems, received the excellence in research award which recognizes her cumulative, consistent and outstanding research output from 2006 to 2011. Professor of Finance, Dr. Ilona Shiller, received the faculty's annual research award for 2011.